President-elect Donald Trump campaigned on a pledge to rebuild the U.S. military into an unparalleled global fighting machine, fueling prospects that the GOP-controlled Congress will go along with raising defense spending well above its current $600 billion annual level in the coming years. But by declaring last week in a tweet that the U.S. “must greatly strengthen and expand its nuclear capability,” Trump has raised the ante of long-term spending by the Department of Defense and Department of Energy and threatens to spawn a new nuclear arms race with Russia, China, North Korea, Pakistan and other rivals and enemies. It is impossible to gauge the potential budgetary implications of what the billionaire businessman has in mind because Trump has provided no details. For instance, it’s unclear whether he is talking about going well beyond the Obama Administration’s current pricey modernization program for the U.S. nuclear arsenal, or whether he would scrap the New Start treaty between the U.S. and Russia that caps nuclear warhead deployment and mandates regular inspections. Yet, by raising the issue weeks before he is sworn in as the 45th president, Trump has opened the door to a renewed debate on U.S. nuclear defense strategy that could lead to the government committing tens of billions of dollars more to Pentagon spending in years to come. Although he vowed to substantially reduce the threat of nuclear weapons during his first term, President Obama in his second term embarked on an ambitious program designed to upgrade the nation’s warheads and launch systems -- including the missiles, bombers and submarines that deliver the warheads. While the government doesn’t provide comprehensive figures for the amount of federal resources that go to all aspects of nuclear defense, the Defense Department and the Department of Energy spent an estimated $42.3 billion on the nuclear program in 2015, according to the Nuclear Threat Initiative. 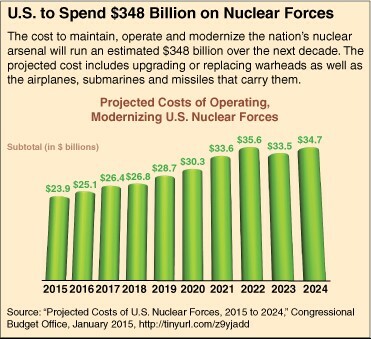 About $23.9 billion of that total went for nuclear forces and operational support. The remainder of spending covered missile defense operations, environmental cleanup of nuclear waste and programs to reduce the global nuclear threat, according to the NTI, an anti-nuclear proliferation research organization. Estimates of how much the government spends on its nuclear weapons program and stockpile vary significantly. But there is no question that spending as a share of the budget has plummeted substantially since the peak of the U.S.-Soviet Union nuclear weapons race during the Kennedy and Johnson administrations. Related: Was Trump’s Nuclear Tweet a Poke at Putin? Throughout the 1960s and early 1970s, nearly two of every 10 dollars spent by the Defense Department went for developing and stockpiling nuclear weapons. Decades of subsequent Cold War negotiations and détente gradually shrank the U.S. and Russian stockpiles of strategic nuclear weapons from tens of thousands to roughly 7,000 each – with even deeper reductions called for under the New Start treaty. Trump’s tweet and subsequent comments to MSNBC’ Mika Brzezinski suggesting he would welcome a renewed nuclear arms race with Russia and others set off alarm bells among nuclear weapons experts and anti-nuclear advocacy groups fearful of a potential global catastrophe -- let alone the added costs to the military.